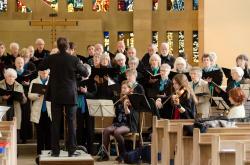 We are a mixed choir of around 70 members and have been an established part of the Sheffield music scene since 1969. We sing a wide range of music from the choral repertoire, and are equally at home with full-scale requiem masses and unaccompanied part songs. Browse the website to find out more about the choir. Vacancies can occur at any time, so if you are interested in joining, please contact our membership secretary via the link on the How to join page. A lighter programme including a varied selection of some of our favourite music from the past five decades, from madrigals to musicals. The concert will be followed by a reception. We are delighted to welcome back three more of our previous Associate Soloists to help us celebrate this anniversary. Visit our Audios page to hear some short excerpts from the spring 2019 concert. 'You'd be hard-pressed to find a better amateur choir..'; ... a stimulating programme...', '...the Fauré [Requiem] was heavenly...', 'An excellent concert with a lovely variety of music and voices... that was the best I have ever heard Escafeld sing'. See our Videos page for recordings of a group from Escafeld Chorale performing in the Winter Gardens at the Classical Weekend in March 2017. Our first 50th anniversary concert ranges across 100 years of choral music, including Schubert's Mass in G Major, Britten's Rejoice in the Lamb, Finzi's Lo, the Full, Final Sacrifice and Fauré's Cantique de Jean Racine. We are delighted to welcome back three of our previous Associate Soloists to help us celebrate this anniversary. A lighter programme featuring a varied selection of some of our favourite music from the past five decades, followed by a reception. More information at Current season.